As the seasons change from fall to winter, drivers are likely to encounter any number of obstacles that increase the odds of an accident. In fact, of the average 5,891,000 vehicle crashes each year, approximately 21 percent (almost 1,235,000) are weather-related. From rain and wind to ice, hail, snow, and sleet, extreme weather events inevitably impact road safety. If you or someone you know lives in California, then you were undoubtedly well aware of the devastating wildfires that tore through the state earlier this year. But whether the cause is lightning, arson, drought, or climate change, fires can occur anywhere, any time, and can spread far and wide in a second. So what are you supposed to do if a wildfire suddenly threatens your area? Because the disastrous effects spread so quickly, it’s critical to be prepared. Consider signing up for your community’s warning system so you’ll receive text alerts in case of emergency. Get to know your community’s evacuation plan, and have several possible exit routes in mind. 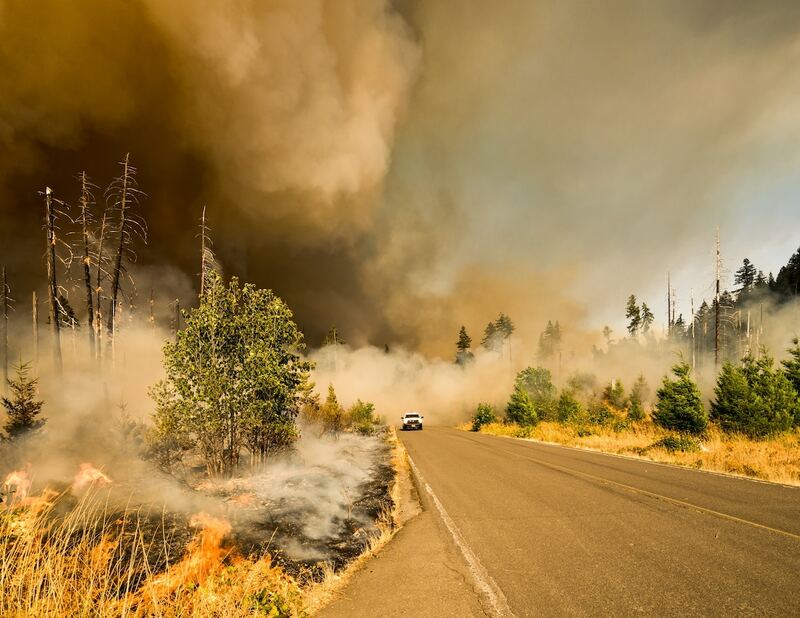 The most important thing to do in the event of a wildfire, of course, is to evacuate immediately. But jumping in your vehicle amid unpredictable flames can clearly be a scary prospect. According to experts, the most important factor in survival is to leave early — don’t debate your decision to evacuate, just get on the road. Because a blaze can “leapfrog” or “hopscotch” across the ground, there are no guarantees that a car can outrun flames. Streets and highways can become blocked in a matter of seconds, and traffic and visibility can become increasingly worse. Don’t wait until the last minute, and just go. As you drive, roll up your windows, close the air vents, and turn on the AC to minimize smoke inhalation and irritation. Take precaution and drive slowly with your headlights and hazards on, as the air quality may compromise visibility. Experts recommend covering yourself with dry fabric, preferably wool, if possible, to protect your skin. If you see flames approaching as you drive, seek out a parking spot that’s free of debris, and try to find a barrier like a concrete wall to block the fire. Most importantly, do everything you can to remain calm, and don’t, under any circumstances, exit the vehicle. According to the National Oceanic and Atmospheric Administration, floods are the most widespread and common weather-related natural disasters. Heavy rains, intense ocean waves, melted slow, or dam or levee breaks can cause sudden overflowing surges of water anywhere in the world. While flash floods can occur spontaneously, the National Weather Service (NWS) issues watches and warnings, intended to give local residents notice that conditions are either favoring a flash flood, or one is imminent. Take heed of these announcements, and evacuate ASAP if necessary. If you’re behind the wheel while a flash flood is occurring, NWS has a simple but potentially life-saving adage to remember: “turn around don’t drown.” More than half of flood-related drownings occur when a car is driven into hazardous flood water. Rushing water is far more powerful and forceful than many people realize — even just six inches of swiftly moving water can knock a person down, 12 inches can carry away a small car, and two feet can sweep away most vehicles. Unlike wildfires, when it’s safest to stay in your vehicle, flash flooding may necessitate a quick exit. If you’re stuck on a road and water levels are rising fast, get out of the car as fast as you can and move to a higher elevation. Avoid driving through water that an electrical or power line has fallen into, and avoid using your phone unless you have to report severe injuries. As you drive, be extra vigilant of objects traveling downstream that could hit your vehicle. If your brakes become too wet to stop your vehicle, you can try to dry them by gently applying pressure on the brake pedal with your left foot while maintaining speed with your right, but evacuate your vehicle immediately if conditions become too rough. Earthquakes are another natural disaster that can occur suddenly, almost anywhere, though they are more likely to occur over fault lines. If you live in an area that’s more likely to be struck by an earthquake, preparation is again key, so having a few escape routes and emergency protocols is essential. That said, driving during an earthquake is a unique experience because the shake may not be felt from a moving vehicle, and there may not be any visible clues as to what’s going on. The only indication some drivers get during a tremor is that they lose control of their vehicles for no apparent reason. The best thing a driver can do in that situation is to slow down until it’s safe to pull over, as far from trees, power lines, bridges, buildings, or overpasses, as possible. Stay in the vehicle until the quake is over, and keep your seatbelt secured. It’s best to avoid using your telephone and instead tune into the radio for emergency broadcasting updates. Once it’s safe to start driving again, pay extra attention to the potentially damaged road and keep an eye out for stalled vehicles and/or dangerous damage. If you receive an alert or you spot any of the signs above, be prepared to take shelter. And if you’re already in your car, get out immediately and stay as low to the ground as possible. It’s best to take refuge in a sturdy building, but if there’s no shelter nearby, get far away from your car and find a ditch or other low area where you can lay down on your front side and cover the back of your head. The only situation in which it’s recommended that you stay in your vehicle is if there’s no lower ground than the road you’re already on; in that case, fasten your seatbelt and lower your head below the windows, covering your head with your hands or a blanket. Hurricanes typically occur in the Southwest U.S. and the Pacific Coast where heavy rains and floods are possible. These tropical cyclones can cause catastrophic damage with wind speeds exceeding 155 miles per hour and can cause torrential rain, leading to potentially fatal flooding. People who live in areas prone to hurricanes are advised to have a wind-safe room in their homes and to evacuate if directed to do so by local authorities. If you’re on the road when a hurricane hits, stay in your car and seek shelter in a parking garage if you can. Avoid driving through water and keep an eye out for fallen wires and other potential hazards. If your car hydroplanes (starts traveling on the surface of the standing water instead of the road), release the gas slowly and steer straight until your tires are back on the road; don’t slam the brakes or turn the steering wheel — wait until you’ve regained traction before lightly tapping the brakes. Plan ahead and if possible, pick a route that’s at a higher elevation and less likely to flood. Maintain a clear windshield by cleaning out dead leaves and other debris on a regular basis. Use your headlights, but avoid turning on the high beams — the extra bright light can reflect off the rain and shine right into your eyes. Keep more distance than usual between you and the vehicle ahead. Never use cruise control when driving in heavy rain, as it can cause you to lose control of the vehicle. In the event that your car hydroplanes (i.e. begins to ride on top of the standing water instead of the road surface), immediately take your foot off the gas, but don’t stomp on the brakes. Instead, turn your steering wheel gently in the direction that your car is traveling to help your tires realign, and when you reconnect with the road, pull over and make sure you’re feeling calm and safe enough to keep going. If you live in or often drive through cold climates, then you may be familiar with black ice, a glaze that forms on the surface of roads due to a light freezing rain or melting/refreezing of snow or rain. The name is a bit of a misnomer since the ice isn’t black, but clear, making it almost invisible. It often forms at night or early in the morning, and is more likely to form on parts of the road that are less traveled on and/or don’t get much sunlight. Though it’s mostly transparent, you can locate black ice in the right lighting conditions if you know what to look for: very shiny, smooth, sheets. If you’ll be driving in areas prone to black ice, it’s a good idea to practice driving on slippery surfaces like ice in a safe surrounding. In a controlled, safe setting, this kind of practice can prepare you for how to react in an emergency black ice encounter. If you do hit black ice, experts generally recommend that you stay calm and just keep going straight — don’t hit the brakes. If you start to veer to the left or right, gently turn your steering wheel in that direction. Take your foot off the gas pedal and head toward an area that has more traction (like snow or sand). If your car starts to skid, stay calm. If you have anti-lock braking system (ABS), put your foot on the brake with firm pressure and allow the car to pump your brakes for you. If you don’t have ABS, gently pump the brakes yourself. In either case, gently steer in the direction you want to go. The best way to prepare for any situation — weather-related or otherwise — is to have an emergency kit in your car that includes essentials like a flashlight, jumper cables, warning flares, and more. Once you’re on the road, if snow starts to fall, drive slowly and increase the distance between you and the vehicle ahead. You’ll also want to be gentle with your brake pedal and don’t use cruise control. If you’re going up hills, avoid tire spinning by gaining momentum before you ascend and then slowing down before you reach the top. If you find yourself driving through a whiteout, now’s the time to slow way, way down. Your visibility will be severely compromised, so the slower you go, the better. It’s also essential to make your vehicle as visible as possible, so turn on all your headlights and communicate with hand gestures if you can. The best option is to stop your car and wait until the whiteout ends. Just remember to turn on your hazard lights, and if you’re running your car (just for 10 minutes at a time every hour to keep heat), crack the window to avoid a dangerous buildup of carbon monoxide. Have Questions About Insurance Coverage? Hopefully, you’re now feeling more confident on the road, but if you want to feel more confident in your car insurance company, it’s time to talk with a Metromile agent. If you’re already a customer, one of Metromile’s qualified specialists can help you figure out the best coverage plan for you. And if you’re still debating which carrier is right for you, call 1.888.242.5204 or visit Metromile.com today to get a free quote.